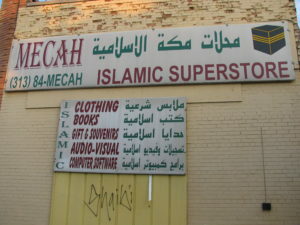 Dearborn is a diverse suburb located roughly 12 miles due west from down-town Detroit. Home of the world headquarters of the Ford Motor Company and Carhartt clothing company, Dearborn also houses the largest Muslim population in the United States. As of the 2010 U.S. Census, Dearborn had a population around 98,153. This census along side most data available online shows approximately 40% of the population in Dearborn coming from Arab ancestry. This information has recently become outdated, as the general opinion of those living in Dearborn would estimate the Arab-American percentage of the population closer to 50 or 60%. Roughly 90-95% of the Arabs living in Dearborn adhere strongly to the Islamic faith while less than 1% would claim to follow Jesus Christ. Many people in the United States who are aware of the sizable Arab population rightfully ask, “Why are there so many Arabs in Southeast Michigan?” The answer is not a simple one since Arabs have been coming to the region for over a century. The auto industry has played a major part in providing jobs for people to fill; one of the main players being Ford Motor Company. In the early 1900s, Henry Ford hired Arabs rather than African Americans. However, the first notable wave of Arab immigrants came to the USA between 1880 and 1920! The Islamic culture of Dearborn is very prominent and has been described in the past as feeling like a different country in certain areas. As of February 2017, there are 37 mosques within 10 miles of Dearborn! 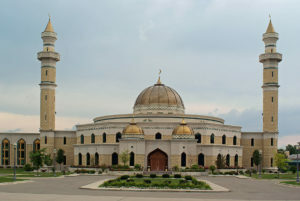 (Visit www.salatomatic.com for up-to-date lists of mosques in any city.) 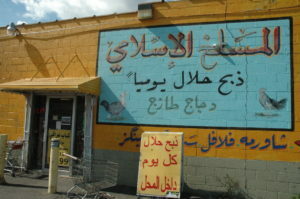 Upon visiting Dearborn, one will find “Halal” meat offered in most restaurants; many signs displayed in Arabic as well as English; and a wide offering of delicious, ethnic foods.